Shirdi Sai Baba Stories,Leelas and Teachings. : Teaching of Baba in action through small dog. Teaching of Baba in action through small dog. Baba is all around us ,as mentioned in Sai Satcharitra He is in everything be it animate or in-animate ,HE exits in all and all exit in HIM .Many incidences from various books and leela's by devotees have been narrated where Baba directly spoke to devotees, teaching them to see HIM exit in all especially in animals . 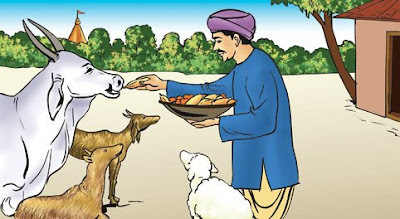 There are incidences in Sai Satcharitra where Baba refers to dog as Himself by belching and showing the satiation of hunger when Chapati were fed to the dog . He refers Himself to a cat who was beaten by a devotee with stick and shows mark on his body of the stick. Baba give's Bayaji timely intimation and saves bulls by saying "I have been tied to the door of a butcher." not only animals . Baba also points out His presence in inanimate object like photo when Prasad offering were forgotten by Ramchandra to Sai Baba Photo in his home in Bandra ....there are many such leela’s which indicate that everything is Baba and Baba is everything. Sai devotee Ranjini had similar experience. We may read holy books innumerable time but if we do not follow them or imbibe their teaching all the reading goes in vain .Similarly teaching of Baba from Sai Satcharitra becomes a mere reading if they are not practiced. 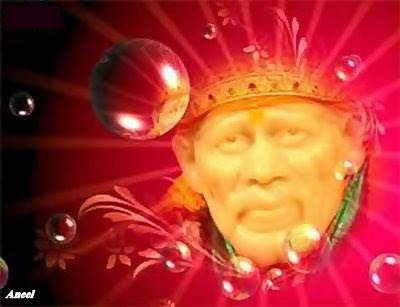 The reading of Holy scripture should be in such a manner that it makes it's home in our subconscious mind and without any effort we follow them in our day to day life and become a true disciple of our Sai .Please read the following incident narrated by Sai devotee Ranjini and her good practice of Sai teaching in her own life..Jai Sai Ram. I would like to share this wonderful experience of mine after reading this mail with subject name "Baba as Dog" in the yahoo group mails . Feb 15th was my brother in law's daughters 1st birthday -Shriyadita Rao at Dharwad,Karnataka ,Bangalore . All the members of the family were preparing for the main function in the evening.Her mom also took her at Baba's darbar (Shirdi) recently in January,she got good darshan . Now the real test ..one small black puppy came around into the house compound at about 4.30 and only few of us came to know about it and we all ran to see it with happiness. It was a little unclean and very shabby and secondly it was a black puppy but really looking cute ..so immediately few of us asked to bring water for him to drink because it was drinking the ground water collected which was not good for his health .Secondly it looked hungry so Jyotirling brought peices of cake also! What happened suddenly a thought came to me or we can say Sai Satcharitra teaching of Baba ...about Baba coming in any form to attend the functions.I read Sai Satcharita so many times and also so many mails from this group keep indicating that Baba can come in any form if we wish for his attendance and blessings. So I told Jyoti and my husband (Naveen rao) that Baba has come and blessed the birthday. HE loves shriya so much ! let us not kick off the puppy out of the house its really Baba only. it will go away on its own will if he is Baba . Then same thing happened it came back into the gate from the small open area in the gate again drank water and ate some more peices of cake.We then allowed him to be there..sometime later my husband opened the gate for some relatives and it followed him outside and just went away! After that in my mind I thanked Baba for showing his love and said if I was mad with devotion so let it be so .....I told my sister -in -law before leaving for Mumbai that Baba came and blessed your daughters birthday! Today morning as soon as I returned back I started checking the mails and lo ! to my surprise the subject of the mail and content was Baba as Dog . Mrs. G.S.K. :Baba. come to my lodgings for a meal. Baba : Yes. when I came, you threw burning fuel at me. Now I thanked Baba for giving me the understanding for not shooing him away and infact treating him so well ,even when HE came in the form of an unclean dog and quitely went away. Next time I pray to him for visiting on such ocassions HE will not say 'I came for the party, but you shoo'ed me away! After reading the email and realising this ,I called Dharwad again and Jyotirling only picked the phone ... I told him the entire incident ! He said 'I also guessed and had the faith that it was baba & feeling really good about it" he said he went on that lane later and searched for the puppy everywhere but coudnt find it . Baba we love your way of showing your presence. Bow to shri Sai's feet ,Peace be to all . Aum Sri Sai Ram . Photo edited and created by Sai devotee Aneel . Thanks a lot Aneel . I truly believe that Baba is in all forms be it dog, cat, cow etc. But sad to say that todays humans view animals as disgusting creatures. Even when me and my family take the trouble to look after stray dogs, people look upon us as mad people i believe. But I don't really care since I know the truth. I humbly pray to Baba for all those animals to be taken good care of at least with good food, shelter and love. I love Baba for the love He showers on animals. Om sai ram.